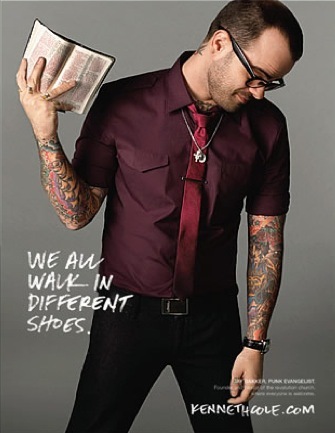 A very interesting article from the Huffington Post on the changing relationship between the evangelical church and homosexuality. Jay Bakker, as the article notes, is the son of Jim and Tammy Faye Bakker, the archetypal 1980s televangelists. (Has anyone seen “The Eyes of Tammy Faye”?) It’s interesting to see how the “next generation” reinvents itself. He is one of the people at the forefront of what may end up being a major paradigm shift for evangelicalism over the next 10, 20, even 50 years. 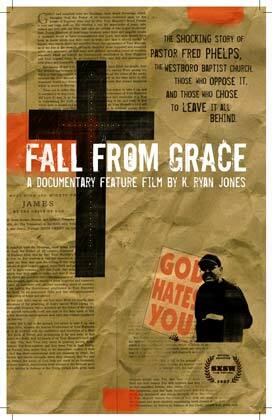 On the completely opposite spectrum of things, last night we watched the documentary “Fall From Grace” (2007) about Pastor Fred Phelps and his hatemongering Westboro Baptist Church, whom you may know from their aggressive protests at the funerals of gay teens, soldiers killed in combat in Iraq and more recently in connection with the shooting in Tucson. It’s one of the most depressing films I’ve seen in a while as a Christian; I can’t imagine Jesus holding up a sign that says, plainly, “God Hates You.” Phelps’ all-consuming anger at secular America shows no signs of abating. He’s even grooming the next generation of hate by indoctrinating his grandchildren, as the film so disturbingly reveals. I wouldn’t say it’s the best film from a filmmaking point of view – a lot of “talking heads,” a similar problem to the equally thought-provoking “For the Bible Tells Me So” – but the subject matter is all-too-relevant in today’s polarized religious climate. Finally, there is a documentary on TLC tonight at 10:00 about infamous former megachurch pastor Ted Haggard, which according to the venerable Perez Hilton may turn into a reality series (sandwiched between an already-full roster of shows about cakes, quintuplets, little people and Sarah Palin). Those who saw Haggard in “Jesus Camp” may find it a little hard to take him at face value, but he certainly has had his life completely destroyed so it’ll be interesting to see how he reboots his public image. We’ll have to record it because I’m looking forward to watching Ricky Gervais host the Golden Globes… something a little less heavy to finish up the weekend!